In 1772, Shenandoah County was formed from Frederick County. At the time, and until 1777, the county was known as Dunmore County, named after the then Royal Governor of Virginia. Our native limestone courthouse was not built, however, until 1795. For some months after the county’s formation court was held in a private residence in Woodstock. By the end of 1772 a county commission had purchased for public use Lot 81, where the courthouse is located and Lot 80, across Court St., where the county jail sits. A house was moved onto Lot 81, was fitted up for courts use, and served the community until the historic courthouse was built in 1795. The building fulfilled numerous functions, serving the judiciary, housing county offices, served as the area’s political center and was the venue for many local events. Over 200 years later the building has experienced changes. The first addition to the courthouse, a large courtroom, was built in 1871. A second addition was built in 1886 to house clerk’s offices. In 1973 the circuit court and county government moved into a new building across Court St., adjacent to the jail. In 2012 the district courts departed for a new courthouse on the north end of Woodstock. Today this courthouse is the oldest still in operation west of the Blue Ridge Mountains. Court functions are still held in the 1871 portion and the 1795 section is occupied by a visitor’s center, museum and offices. 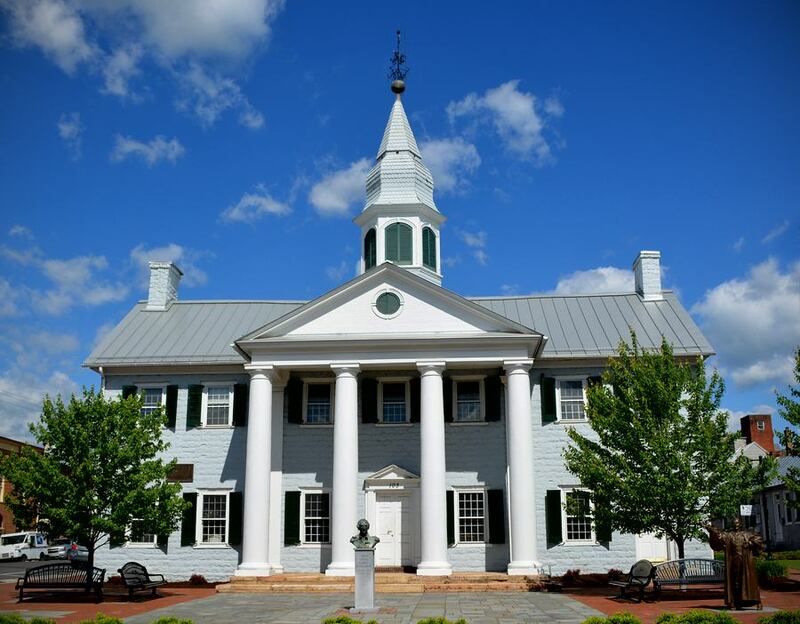 When the Shenandoah County Board of Supervisors began planning for the rehabilitation of the 1795 Historic Courthouse, they asked if SCHS would consider occupying a part of the building and being a part of its future use. In 2013 we agreed to partner with Shenandoah County Tourism to create and operate the Visitors Center and Historic Courthouse Museum. With our loyal volunteers we are able to make Shenandoah County’s most iconic historic building accessible to the public. We also are pleased to be able to locate our offices within the historic courthouse and play a role in its preservation. A loyal team of volunteers hosts the Visitor Center at the Historic Courthouse each Thursday, Friday and Saturday from11:00 AM to 4:00 PM year-round. New members of this team are always welcome. An application to become a Courthouse Team member is available HERE.